Photo & information sent by Bob Hodges, President of the Weta Class North America, and also an experience A-Class sailor. For those who think sailing performance Cats is the only thing some of us have in mind Bob is a good example on the fun scope Multis have. I could spend a whole day sailing a Hobie Wave with a bit of wind no prob, even more with a Weta Tirmaran. Join the Weta Swarm at the 2018 US Multihull Championship also known as the Alter Cup! The Weta Class of North America is geared up and excited about hosting for the first time the US SAILING Alter Cup National Multihull Championship. 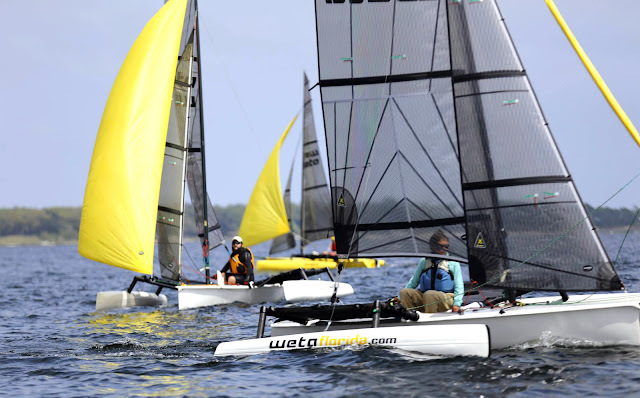 The regatta is being hosted by Fort Walton Yacht Club in Fort Walton Beach, FL April 18-22. This championship is also concurrently the 2018 Wetafest. The Wetafest regatta was started several years ago by FWYC member and multihull and general go fast guy Cliff Farrah (J-30 to Corsair trimaran to Weta and throwing in a Viper 640 and also cruises around in a Tesla Lamborghini Killer). Cliff was so enthused after he got his first Weta that he took the idea to FWYC and Wetafest is now probably the most popular Weta event on the annual Weta North American calendar. This year’s championship already has 33 entries pre-registered and as of today still has two charter boats available. The Weta is typically raced singlehanded but some entries are doublehanded . For the Alter Cup, all entries will be scored for the podium finishes and there will be separate awards for singlehanded and doublehanded entries for the Wetafest portion of the event. FWYC has a full schedule of dinners and breakfasts during the course of the regatta and there is even an afternoon Weta seminar with Olympic medalist Randy Smyth who will also be racing the event. As someone who also sails and races a foiling A-Class catamaran, I still really enjoy sailing and racing the Weta. The Weta is one of the most fun and easy to sail high performance boats that is also very forgiving for smaller sailors like women and juniors. Last year the class held its National Championship at the Columbia River Gorge and all the racing was held in 15-22 knots of breeze with two days having gust bands up to 30 knots. No racing was cancelled and the Weta sailors showed how fast and tough the boats and sailors were. Check out the links at www.wetamarine.com and www.wetanorthamerica.com.